Me and my friend have this project together, we call One Thing a Month. So if you want to know, what I’ve been up to for the last couple of months, you should totally check it out! Most of it is animation, since we’re both into it. We’re experimenting with something new every month! So stay tuned for the next “thing” coming up in a few days! Okay, so I finally started work on my BA! I’m going to explore the effects of interactive narration and atmosphere in computer games. At least that’s the “scientific” topic I set for this project. In reality it’s going to be a little browser game, where you control an astronaut, who’s stranded on a lonely planet and has to repair his spaceship to get home. While being confronted with feelings of loneliness, isolation and his own fading sanity. This might be the view where most of the game takes place. The core mechanic could be described as an interactive story with simple puzzle solving and some psychological themes. It’s supposed to be short, but there should be multiple ways of approaching the astronaut’s predicament, so that in the end you should have about two or three alternative endings for the game, of which some probably won’t make it into the final build until the deadline. But that’s fine. At worst I’m going to reuse my finished graphics and animations for mockup-clips of alternative paths, the player could have taken. 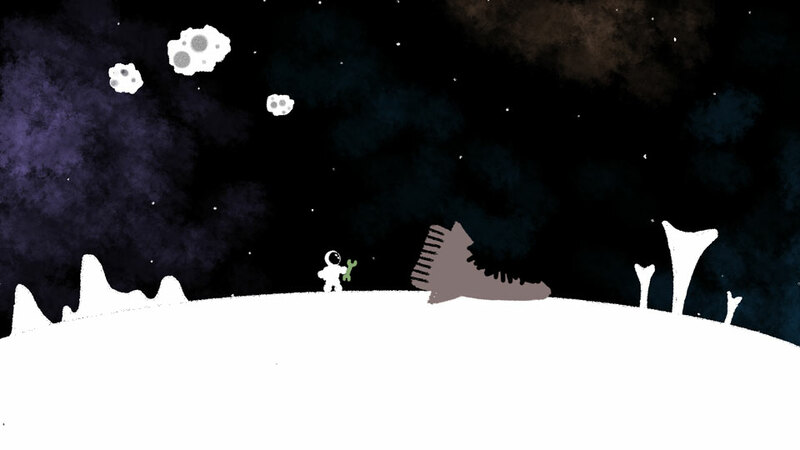 So, after the crash of his spacecraft the player takes control over the little astronaut. After some exploring he’s supposed to repair his ship by collecting scattered parts and resources to fix the vehicle and get home safely. The camera always follows the player’s movements while the world rotates around him. Think of Super Mario Galaxy in 2D. 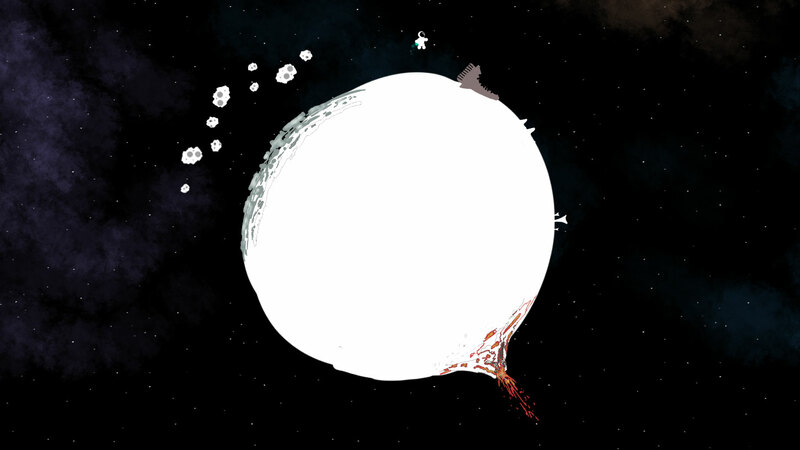 The player’s supposed to feel small and abandoned in this unfathomably large space. So the camera might zoom out when something important on the other side of the planet happens. The plan is to introduce elements of psychological weirdness to the world over time through visual and audible hallucinations. One aspect I found particularly interesting while researching the effects of prolonged isolation, was the fact that after a while the brain initiates monologues as a protective mechanism to keep the social animal called human from going insane. 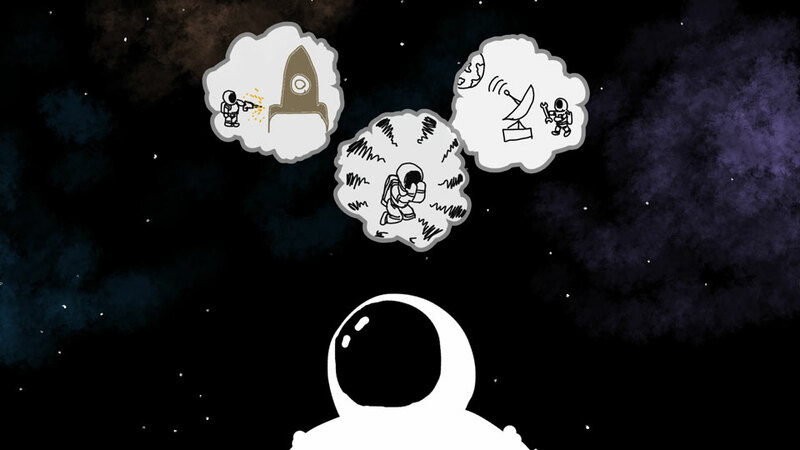 A way to implement this effect could be to enable the player to check the thoughts, worries and general mental stability of the astronaut with a button command. This also comes in handy as a way to communicate possible quests to the player, since the astronaut’s thoughts keep spinning around finding ways out of his situation. The player decides for one or the other approach, completes his chosen task and the story branches off to the next decision, which eventually leads to one of the game’s alternative endings. I’m working with a programmer and a sound designer, who are getting the game to run and making it sound amazing respectively. My job is to make everything look good and eventually produce mockup animations for stuff that may not be done by the end of the given time frame. The graphical style will be inspired by surreal Sci-Fi illustrations and animations, all converted into a very minimalistic 2-dimensional style, that should be quick to produce and rather easy to animate. It needs to be handed in by the 15th of January, so we’re on a tight schedule already. I collected some inspirational links for my work, so maybe these will give you a better understanding of where I’m headed with all of this. Well, I’ll be off catching some much-needed sleep.